Elbow an opposing player in the face. Get ejected and don’t leave the court in a timely fashion. Miss when you try to punch an opposing player. Attempt to bring a loaded gun aboard an airplane. That’s right. Sebastian Telfair was handed the suspension after violating the league’s firearm policy. Obviously, the NBA is much more lenient than homeland security, who would have probably shot him dead. Telfair claims to have accidentally brought the wrong bag with him for the Portland Trail Blazers road trip two weeks ago. The gun, which is registered in his girl friend’s name, was hidden in a pillow case inside of her travel bag. Something sketchy is going on here. Why does she need to carry a loaded gun around? The two have long since moved out of Coney Island and live in Portland, which happens to be one of the safest big cities in the country. 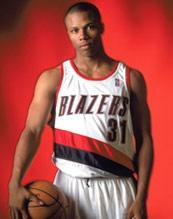 Furthermore, it’s not like Telfair is a big star anywhere outside of New York City. The couple isn’t getting flocked by thousands of fans. I like Telfair a lot. I read Ian O’Connor’s book about him and will eventually get around to seeing the movie about his senior year in high school. But this was just stupid. He hasn’t done a great job in the league so far and these little troubles that he gets into will not look good when it comes time for a second contract in a few years.